In order to support a planing application for the redevelopment of the former council offices, a Phase I desk study report was prepared by the agents to support the application. Feedback form the local authority contaminated land officer is presented with the documents with F/YR16/0672/F which rejected the recommendations of the report and clarified the requirements of an intrusive investigation. 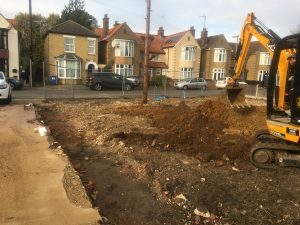 Demeter Environmental were commissioned to undertake the Phase II works. 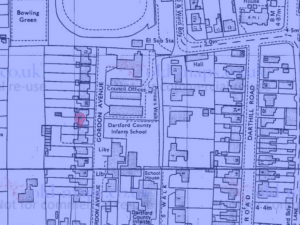 The initial phase was to review the existing desk study report to determine the potential issues, Ordnance Survey maps in the public domain were used to research the history of the site as well as aerial plates and Streetview images, which indicated the site was previously occupied by council offices with a library and school adjacent to the site. The Streetview images identified two single story buildings with cement sheeting roofs on the site up to April 2010, by October 2015 the buildings had been cleared. Based on walkover observations made in the desk study report hard-standing was present and the possibility of made ground could not be discounted. 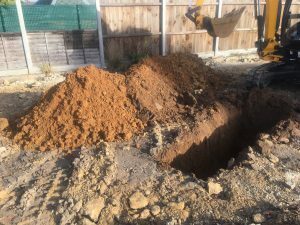 The site investigation was undertaken in October 2016 and the investigation was based on a 10m non-targeted herringbone sampling pattern, as the site was open trial pits were chosen as the preferred investigation method. The investigation recorded made ground to a depth of 0.5mbgl across the majority of the site, and a number of samples of the made ground were scheduled for chemical analysis. The results were compared against Tier 1 thresholds to determine if the made ground on site posed a risk to the the proposed residents, concrete, water mains, or flora and as al results were below their thresholds, the assessment demonstrated that the made ground on the site was ‘suitable for use’ and remediation was not required for the proposed development. The Phase II report was submitted with F/YR16/3113/COND, the memo accepting the report can be accessed here.